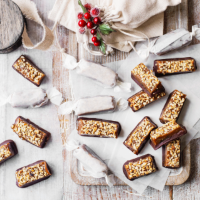 Gorgeous caramels, with hints of gingerbread, a crisp nutty topping and chocolate bottom. Wrap each in a twist of waxed paper or baking parchment before packing. 1 Grease a square baking tin (about 17cm x 17cm) and line the base and sides with baking parchment. Put both sugars, the golden syrup, treacle, butter and double cream in a large saucepan. Add the salt, vanilla, cardamom pods and cinnamon stick, then place over a gentle heat to melt the butter and dissolve the sugars. 2 Put a sugar thermometer into the pan and continue to cook steadily over a low-medium heat, stirring often, until the caramel reaches 121˚C (‘hardball’ stage). Put the ginger in a large heatproof bowl. 3 Working quickly, remove the pan from the heat and pass the caramel through a metal sieve over the chopped ginger, stirring well to combine. Next, pour the mixture into the prepared tin, leave for a minute to set slightly, then scatter over the chopped nuts in an even layer. Set aside until completely cool and firm – at least 4 hours, preferably overnight. 4 Melt the chocolate in a heatproof bowl set over a pan of barely simmering water (or use a microwave), stirring until smooth. Cut the caramels into pieces using a lightly greased, sharp, serrated knife. Dip the underside of each caramel into the melted chocolate, then leave to set firm on baking parchment before wrapping. FYI: The caramels can be stored in an airtight container for up to 1 week.